This implements the buffer wrapper for an istream. The buffer array passed in is not owned by the stream buf object. Definition at line 47 of file llbufferstream.h. Definition at line 45 of file llbufferstream.cpp. Definition at line 54 of file llbufferstream.cpp. Definition at line 133 of file llbufferstream.cpp. References DEFAULT_OUTPUT_SEGMENT_SIZE, LLBufferArray::endSegment(), LLBufferArray::makeSegment(), mBuffer, mChannels, LLMemType::MTYPE_IO_BUFFER, LLChannelDescriptors::out(), start, and sync(). Definition at line 249 of file llbufferstream.cpp. References end, mBuffer, LLMemType::MTYPE_IO_BUFFER, LLBufferArray::npos, NULL, S32, and start. Definition at line 172 of file llbufferstream.cpp. References end, LLBufferArray::endSegment(), LLBufferArray::eraseSegment(), mBuffer, mChannels, LLMemType::MTYPE_IO_BUFFER, NULL, LLChannelDescriptors::out(), LLBufferArray::seek(), and LLBufferArray::splitAfter(). Referenced by overflow(), and ~LLBufferStreamBuf(). Definition at line 61 of file llbufferstream.cpp. 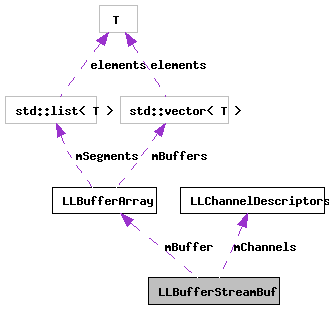 References LLBufferArray::constructSegmentAfter(), LLSegment::data(), end, LLBufferArray::endSegment(), LLBufferArray::eraseSegment(), LLChannelDescriptors::in(), LLSegment::isOnChannel(), mBuffer, mChannels, LLMemType::MTYPE_IO_BUFFER, LLSegment::size(), LLBufferArray::splitAfter(), and start. Definition at line 131 of file llbufferstream.h. Referenced by overflow(), sync(), and underflow(). Definition at line 128 of file llbufferstream.h.